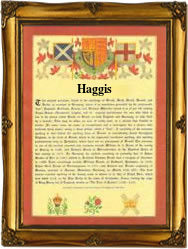 Recorded in the spellings of Haggas, Haggus, and Haggis, the origins of this interesting name has no connection with the national dish of Scotland! The surname is Anglo-Scottish and locational, deriving from any of the numerous places in both Scotalnd and England originally known as 'haghouse' . This was a place for storing wood fuel for the winter, or possibly as a place to mature timber, which used to take upto seven years. The development is from the Olde English pre 7th century "hag", meaning "a clearing" or possibly the Old Norse "hogg", a cutting blow, plus "hous", a shelter. On this basis it would seem that whilst the surname was usually locational, it may also have been used as a job descriptive name for a forester or even timber merchant. Early examples of the surname recording include Emma Hagase in the 1379 Poll Tax register of Yorkshire, while Gilbert de Haggehouse of Scotland, was arrested in England in 1394 as a spy! Other examples are those of John Hagas in the Register of the Freemen of York in 1401, William Haggus, a landowner of Aibrothoc, Scotland, in 1427, and Dominus Johannes Haggis, who was a witness at Elgin, Scotland, in 1547. The surname as Haggis is also recorded in England in 1825, when Margarett, the daughter of John and Mary Haggis was christened at Haworth, Yorkshire, on July 24th of that year. The first recorded spelling of the family name is believed to be that of Richard del Haghous, which was dated 1327, in the Subsidy Rolls of Yorkshire. This was during the reign of King Edward 111 of England, known as "The Father of the Navy", 1327 - 1377. Surnames became necessary when governments introduced personal taxation. Throughout the centuries surnames in every country have continued to "develop", often leading to astonishing variants of the original spelling.